Ready to try the best ginger cookies ever? 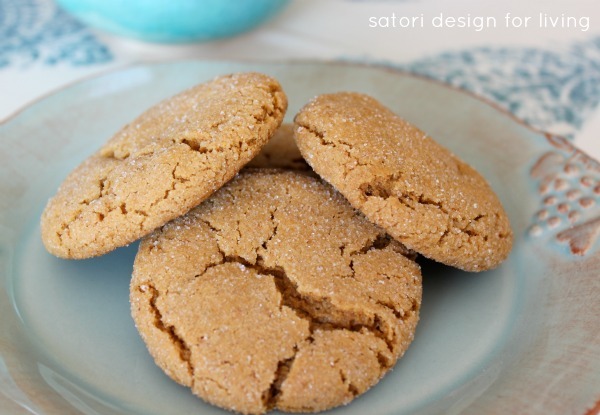 Follow this recipe to make soft and chewy cookies with the perfect amount of ginger spice! Fall is when I like to roll my sleeves up and really get going in the kitchen. There’s something comforting about pulling out my favourite recipes, putting on some music and getting my bake on! I think it’s the aromas, the warmness of the oven and knowing that my family is going to be oh-so appreciative when they get home! It also makes packing lunches a little easier when there’s something you can grab that isn’t filled with preservatives and who knows what else, not to mention the excess packaging. Yesterday, I took part of the afternoon off to make some butternut squash soup and stumbled upon one of my favourite fall cookie recipes. I couldn’t resist making them, and, although I can’t share an actual cookie with you, I thought I’d pass along the recipe. You haven’t lived until you’ve tried these soft and chewy ginger coolies ;) My go-to fall baking recipe for lunches and snacks! Note: As usual, I modified this recipe to up the health factor a bit and they still turned out delicious. I’m doubting my holistic nutritionist friend Karen would approve, but I think they’ve moved a little further away from the naughty list! In a medium mixing bowl stir together the flour, ginger, soda, cinnamon, cloves, and salt. Set aside. In a large mixing bowl beat shortening until softened. Gradually add the 2 cups granulated sugar; beat until fluffy. Add eggs and molasses; beat well. Add half of flour mixture; beat until combined. Stir remaining flour in with wooden spoon. Using a ¼ cup ice cream scoop, shape dough into 2-inch balls. Roll in the coarse sugar. Place on an ungreased cookie sheet about 2 ½ inches apart. Bake for 12 to 14 minutes until cookies are light brown and puffed. (Do not over bake or cookies will not be chewy.) Let stand for 2 minutes before transferring to cooling rack. Cool. Makes 25 giant cookies. Soft and chewy cookies that are packed with flavour! Bake for 12 to 14 minutes until cookies are light brown and puffed. (Do not over bake or cookies will not be chewy.) Let stand for 2 minutes before transferring to cooling rack. Cool. Do you share my enthusiasm for fall baking? What are some of your favourites? This is my kind of cookie! Have you tried white whole wheat flour? We’ve replaced all our AP flour with it — it’s the perfect way to increase whole grains. I bet that flour would work really well in these cookies. Thanks for sharing how you made this recipe better for you — I always appreciate that! I’ve never heard of white whole wheat flour. Is it the whole grain ground finer? I love ginger cookies, so these look delish to me! Just hand over some milk and I’ll be all set. Thanks for sharing your recipe. Oh my gosh, these look SO good! 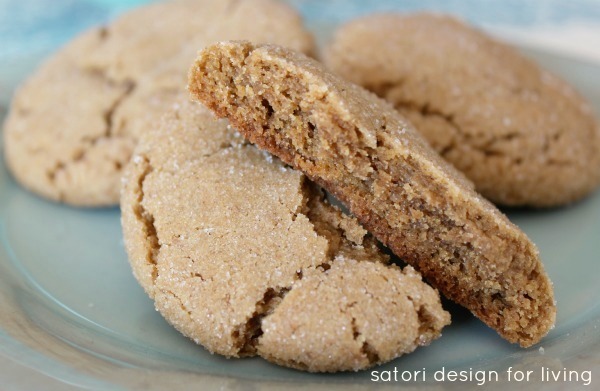 My sister is a ginger cookie fanatic, so I’m looking forward to making these for her- thanks! These look yummy! I’ve been looking for some new cookie recipes to try — these are going on my list :) I agree that these would be great with white whole wheat flour — made from hard white spring wheat as opposed to red wheat — it’s finer than regular whole wheat and has a milder taste in my opinion. Thanks Judi. I’m going to look for that flour! these look delish! Just got some molasses today – on my list! These cookies sound so delicious. I like how you used butter instead of shortening and substituted whole wheat flour for some of the regular flour. I love findings ways to make recipes more healthy and the swaps you made were clever!